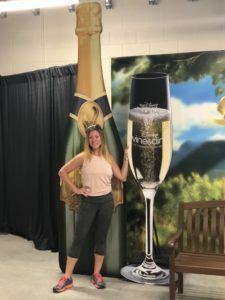 This weekend began and ended yet another runDisney Wine and Dine race weekend in Walt Disney World and the weekend was so jam packed with awesome that I honestly don’t even know where to start writing. 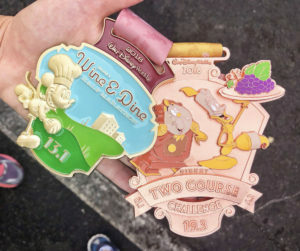 runDisney’s Wine & Dine weekend has been going strong since the first Wine & Dine half marathon in 2010. 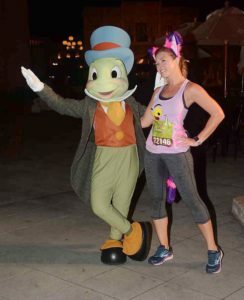 Back then – and until 2015 – this was the only runDisney nighttime half marathon of the season. 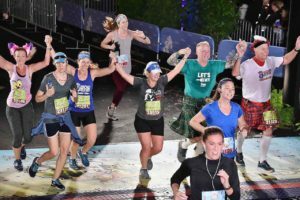 I imagine the crowds, necessary road closures, and unpredictable weather of central Florida in early November made the late night race a challenge to orchestrate – so it’s no surprise that, since 2016, this half has been run in the morning like all of the others. With the first race of the weekend being on Friday morning, Expo officially opened on Thursday at 10 a.m. That said, as is the theme lately, things started earlier than announced and we were in the gates and at bib pickup at the new Arena at ESPN Wide World of Sports by around 9:30 that morning. 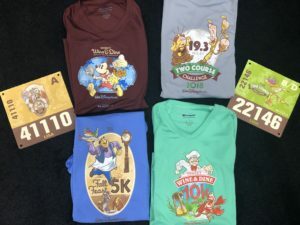 After taking care of bib pickup and checking out the official merchandise at the new Arena, we headed back to the VISA Center for race shirt pickup (check out the amazing shirts we got this year!) and a walk through of the masses of tempting third party merchandise. The areas inside and out were as usual loaded with great photo ops – so of course it remains the case that you should always plan time at Expo to browse the merch and grab some great pictures. 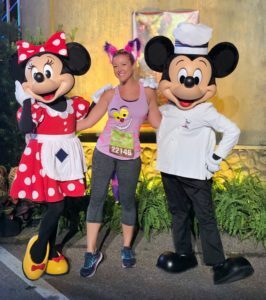 If it’s your first time at a runDisney event, make sure you hang onto the clear plastic drawstring bag that you get with your race shirts. That’s what you’ll use to check any items that you don’t want to drag with you during the run on race mornings. 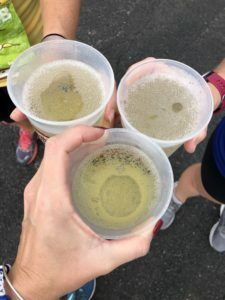 Also, if you buy a beer at Expo and bring your cup to the beer stand after the half marathon, you can enjoy a post-race beer half price!! 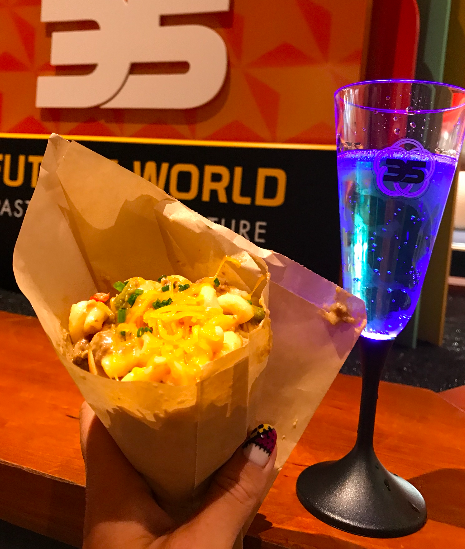 Or be like us and get the incredibly delicious pineapple cider. 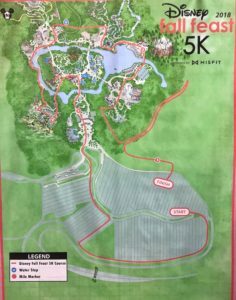 Onward to Friday morning and the Fall Feast 5K. 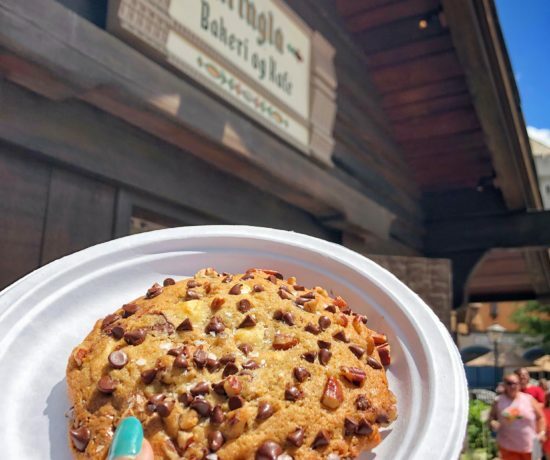 (Say that 10 times fast….) 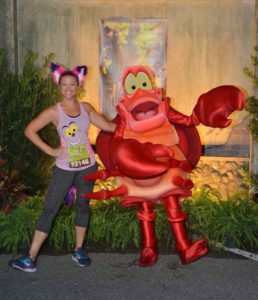 We all know I’m a huge, huge fan of the runDisney 5K events and this one was no different. 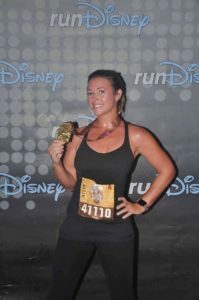 The first wave of the first corral released at 5:30 and I was in it – so I was able to get out ahead of the crowd, grab every single character stop, and finish in less than 29 minutes. 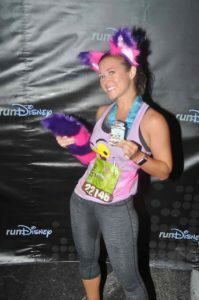 Not to mention that I got my body on schedule for those 1 a.m. wake ups before heading into the 10K and half marathon. 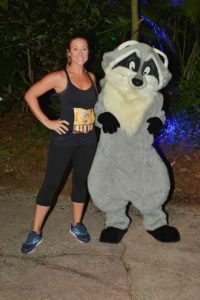 The Wine & Dine 5K takes place at Disney’s Animal Kingdom before sunrise. 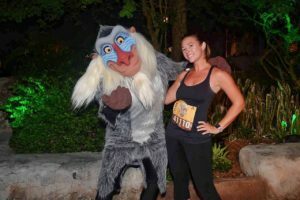 The course is loaded with animal-themed character stops and offers an incredible, intimate experience of pre-dawn Animal Kingdom with music playing, the Tree of Life lit with laser projections, and Pandora in all of its after dark beauty. 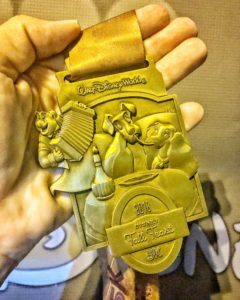 Not to mention…if you’re doing it for the bling – and we all know we kinda are – the medal was beyond adorable. 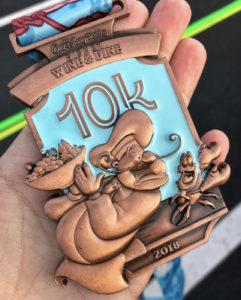 With the 5K under our belts, it was time to move on to Saturday’s Wine & Dine 10K. 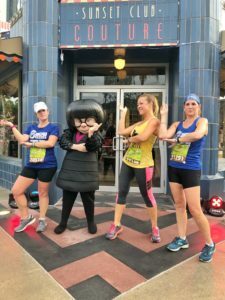 And I’m not going to lie – with all of the construction going on at Hollywood Studios and elsewhere, what was available for the course was a bit duller than usual – but there was so much good that morning that I barely remember that first 4 mile stretch on the road. 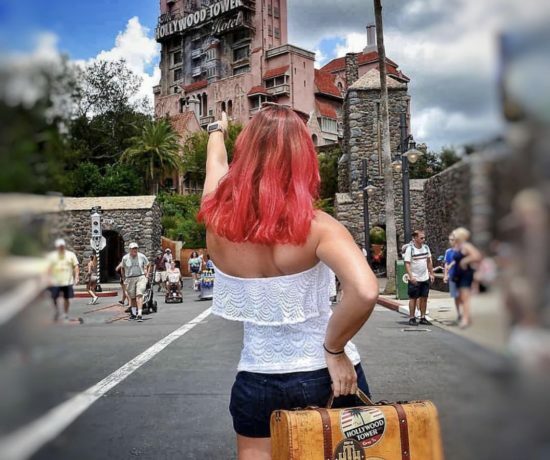 Those of us that drove to the event parked in the Epcot parking lot and then took a bus to Magic Kingdom’s parking lot where we were treated to some awesome character photo opportunities before heading to the corrals. 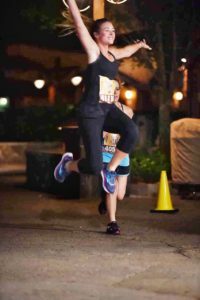 The first wave of the first corral of the race then started at 5:30 a.m., with all of us winding our way back to the finish line at Epcot. 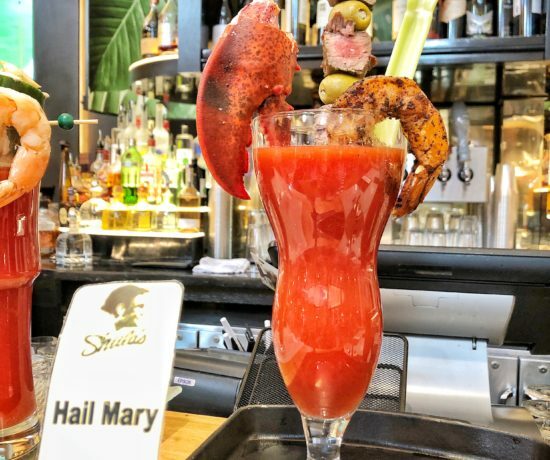 This made for 4 out of 6.2 miles of the 10K that were on the road. 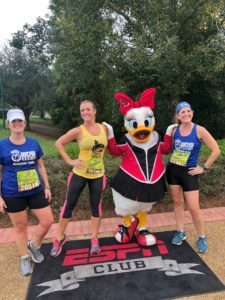 But the company was so great, the weather was so gorgeous, and those last miles in and around Epcot before sunrise were so beautiful that it was easy to forget the miles of dark road that preceded them. 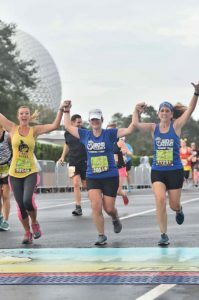 Like most runDisney races, I had the pleasure of running this race with a wonderful group of dear friends and crossing the finish line with them by my side made the run so much sweeter. And then it was time for some more bling. 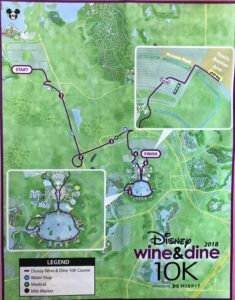 And then there was one left – the second half of the 2 course challenge, the Wine & Dine Half Marathon. And brace yourself for some kvelling because this was the FUNNEST. RACE. EVER. 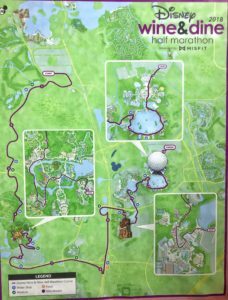 We again parked in the Epcot parking lot and took the provided buses over to Magic Kingdom to start the run, which wound its way down the road, into Animal Kingdom for another look at Pandora, over to Hollywood Studios, and then past the Boardwalk resort and through Epcot. I have an overwhelming amount of good stuff that I want to write about this race. 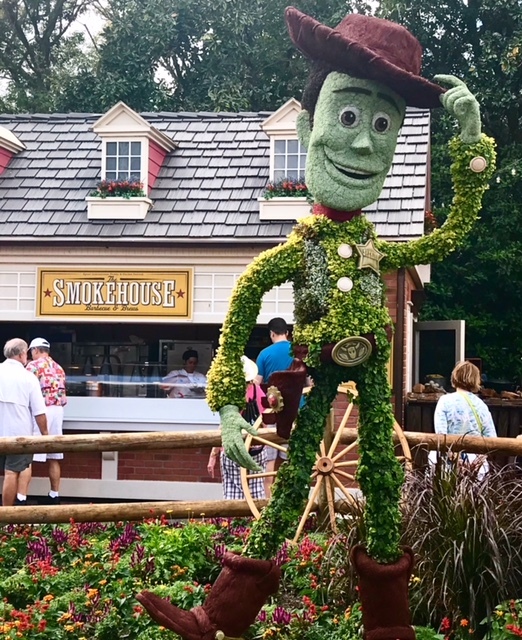 Everything about it from start to finish was so wonderful, from the weather to the course to the company to the characters. 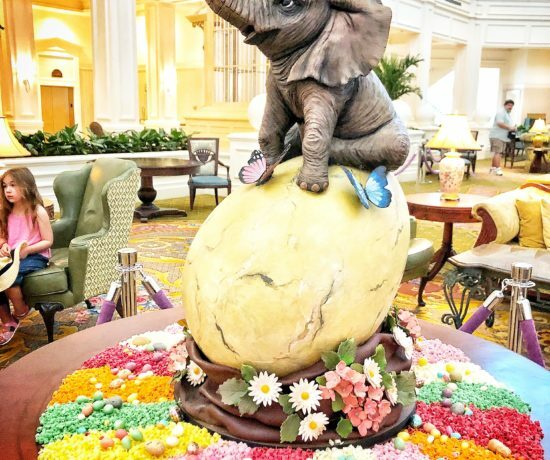 For starters, as is the norm, Disney had the foresight to plan the race for the weekend that Daylight Savings Time ended – so we “fell back” over night before the half. And when you’re waking up at 1 a.m., an extra hour of sleep is priceless. The course itself was a blast. 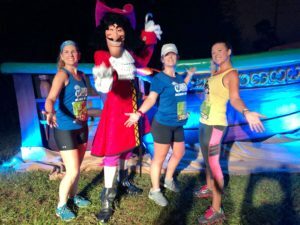 We started in the Magic Kingdom parking lot and ran 4 or so miles on the road, but it was loaded with light shows and music and giant movie screens and characters. 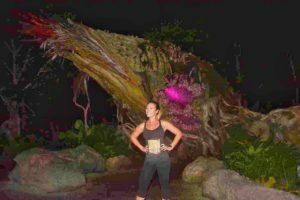 Then we ran through Animal Kingdom, including Pandora just after sunrise, and over to Hollywood Studios. 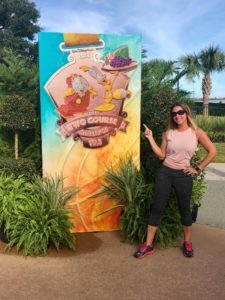 After leaving Studios, we rounded past Boardwalk and into World Showcase, finally crossing into Future World and on to the finish line in the Epcot parking lot. 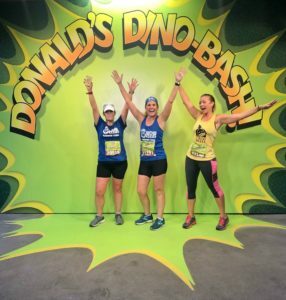 But none of that would have mattered if I hadn’t run an amazingly fun race with great friends. I’ll be honest with you all here. 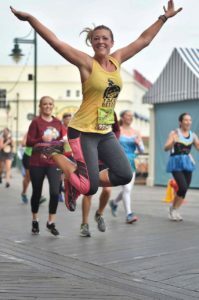 I’m not always a social runner and, on top of that, while I wasn’t a runner growing up, my competitive nature kicks in on the course. 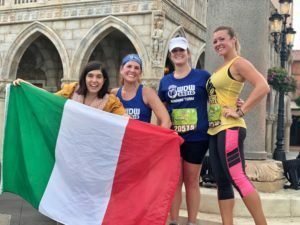 The friends that I was running with are the same way competition-wise, and so while we always start these races swearing we’re going to take it easy and enjoy the race and stop for lots of characters, we often get going and slowly speed each other up along the way until we’ve crossed the finish line. But this time we kept each other in line. 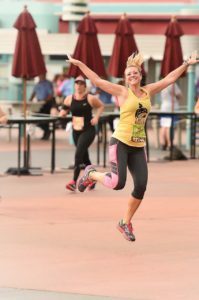 And while we booked it at an incredible pace while we were moving, we introduced a running technique that I’ve affectionately deemed DISNERWATERVALS. 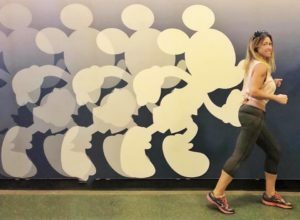 Which is when, instead of running traditional timed intervals, you run like a maniac but stop at every single character and walk through the water stops to hydrate – thus creating a race where you work hard but still max out on getting your money’s worth. 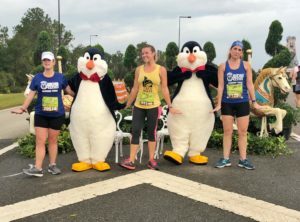 We might not have traditionally PRed the race – but it was without a doubt a PR in plain old fun. 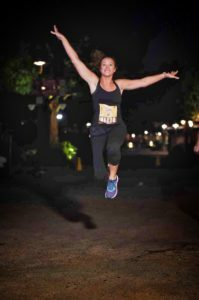 There’s nothing like crossing a finish line knowing you’ve milked the course for everything it was worth. And the bling for the half and the challenge was amazing. Check out that rose gold!! All in all it was one of my favorite race weekends ever, even with the crazy, construction-limited courses. 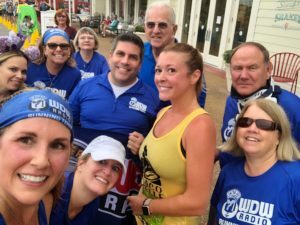 And now I’m going to take a minute to kvell over my people and my running team because they are amazing and you should join us too. 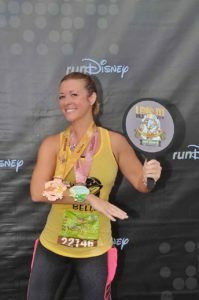 A couple of years ago, I joined the WDW Radio running team. And I love them all so, so much. 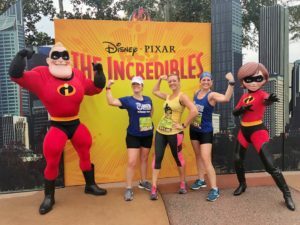 I’m not even a social runner, by any stretch of the imagination – but running the runDisney races with this group is so much fun. And every penny that they raise goes toward Make A Wish. 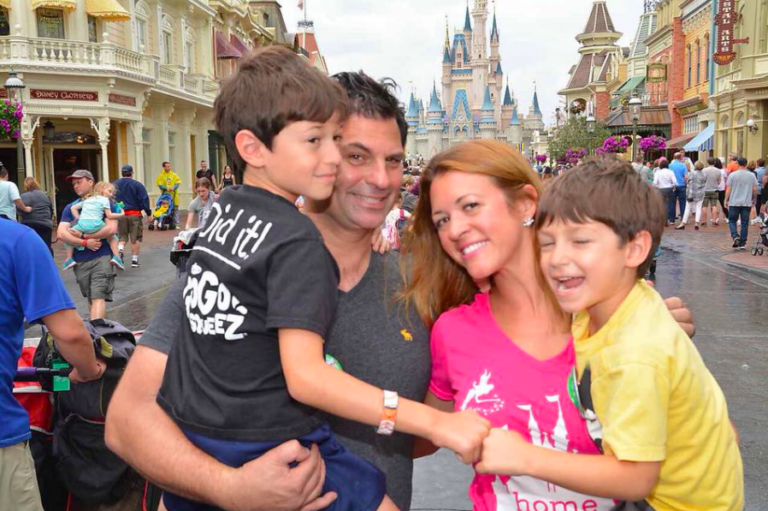 Every year they sponsor a family’s trip to Walt Disney World during marathon weekend and we are all blessed to meet that family face-to-face during a meet that weekend. 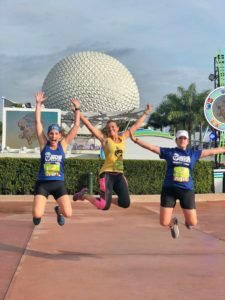 I love what running has done for my life but being a part of this team has added so much more meaning to the races – from friendships and community to the knowledge that we are making a very tangible difference for a family that needs it. 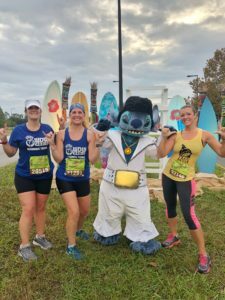 If you have ever considered participating in a runDisney event and are at all curious about this team, please reach out. 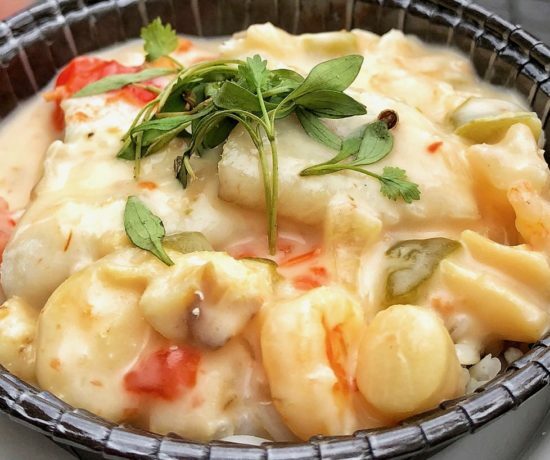 We would love to have you join the family. And that, my dear friends, is a wrap!! 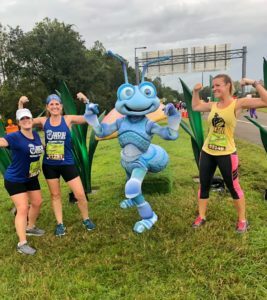 Did you run too this weekend? If so, I want to hear all about your experience! !